Check out new volunteer management trends for 2019! Technology is vital for so many reasons. It’s an essential tool to recruit today’s connected volunteers. It also helps us strengthen relationships and track impact. This year’s survey results help the sector better understand where we stand right now and where we need to go. WHY conduct a survey of volunteer management? Our field needs this. Although researchers have conducted similar surveys, none have attempted to understand trends over time through a survey that occurs (and evolves) every year. We All Need This Information To Be Better Advocates. Volunteer resource managers can benefit from seeing how their colleagues rate their own priorities, challenges, and opportunities. Volunteer-led organizations need clear benchmarks to help them make meaningful comparisons and informed decisions about their volunteer engagement. Nonprofit consultants, trainers, and capacity builders need to know which are the greatest needs for our field. And, we all need this information updated every year. We plan to conduct this survey each year so that we can begin to track emerging trends in our field. WHO helped distribute the survey this year? We are grateful for the help of the following distribution partners and others. If you are interested in helping next year (or helped this year and don’t see your org listed), please email Tobi at tobi@volpro.net. In the fall, we’ll send you a press kit to make sharing with your network easy. Get this year’s VMPR Tech Edition straight to your email! Need Copies of the Previous Volunteer Management Progress Reports? The survey is a project of Tobi Johnson & Associates | VolunteerPro in partnership with Pam Kappelides at La Trobe University. 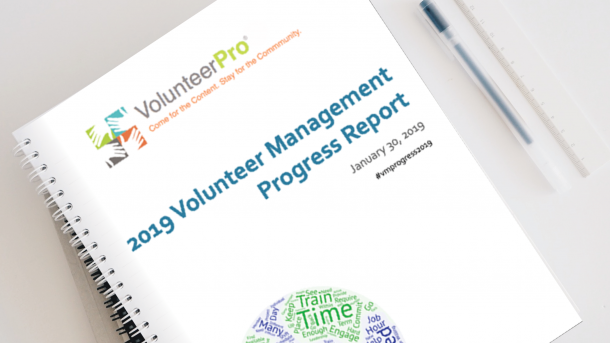 Our 2019 Volunteer Management Progress Report - Tech Edition is Available NOW! Find out the results from our fourth year of surveying over 1500 volunteer management professionals on their biggest challenges, tech competencies, and perceived effectiveness!